This dual-sided box was painted by the talented Palekh artist Ludmila Gelisheva. It shows the scenes from the popular Russian fairy-tale "The Snowmaiden".The tale was also adapted into an opera by Nikolai Rimsky-Korsakov. 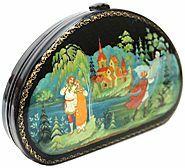 On the other side of this purse-shaped box we can see the recognizable moment when the Snowmaiden melts the eyes of the amazed villagers. Mizgir wants to help her but everything is in vain; the merciless rays of the sun continue to kill his beloved girl. In the left part we can see Lel playing his flute. The work is a good example of intricate Palekh art. The greens and blues are domintaed here. Hair thin gold and silver accents have been used extensively throughout the composition adding rich luminescence and delicacy to the piece. The Snowmaiden's figure is painted to look transparent to remind the fact that she is the daughter of nature. The box's exterior is decorated with intricate gold leafy patterns. The box is constructed from paper-mache. Black lacquer is used to paint the exterior of the piece while red lacquer completes the interior of the work. The box is hinged at the bottom, and the box rests flat. The artist wrote her name, the year of 2014 and the village name of Palekh along the bottom of the compositions on both sides in gold paint.